Unless you have the good fortune to be part of a regular circle or group sitting for psychic phenomena, then the best way to learn about spirit is to read, read, read. Luckily, many of the older classics of the spiritualist movement are available free online and we will cover some of those in future posts. But recently there have also appeared a large number of outstanding books on the topic that are extremely enlightening and wonderful to read. Below I reproduce three reviews that I have written and posted on www.amazon.com. Each of these books can, of course, be obtained through Amazon. Skepticism is always useful, especially when one confronts stories such as this one told eloquently by Tom Harrison in Life After Death: Living Proof. After all, Harrison himself warns his readers about frauds in the psychic world. But there comes a time when one must lay aside the skeptical attitude, think rationally with an open mind, and evaluate the source and motives of the writer. When I did that with Tom Harrison’s account there was only one logical conclusion – Harrison is telling the truth! I had the good fortune more than 30 years ago to sit in a séance with a good medium and my wife and I went away from that with a feeling of wonder. While that experience came nowhere close to those recounted by Harrison, we were provided with precise information that nobody else in the room had any access to (in fact we had never met any of those folks before). On top of that, the “spirit” voice accurately described a unique antique clock that was ticking away on our mantle some 80 miles away and he proceeded to say he was going to “fix” it for us. When we returned home, it was fixed all right! It had stopped running and it has not resumed since. Harrison recounts a similar experience of psychic tinkering with clocks and watches but Harrison’s spirit was much more skilled with clocks than ours was. As I examined Harrison’s claims it became abundantly clear to me that he has absolutely no motive for fabricating even the slightest minor detail in this book. He does not gain financially from his work (profits are donated to cancer victims); he does not have any personal program or organization that he’s pushing; nor is he drumming up an audience for future lectures. He is an old man wanting to leave for everyone an accurate description of wonderful experiences dating back some 60 years. Likewise, those séances Harrison sat in so long ago in England were not public affairs and the motive for having them was as pure as any could be. Those folks were fascinated with the ability to contact their departed loved ones. They were not conjuring up the spirits of Napoleon, Jesus or Shakespeare – these were common, every-day spiritualists visiting with their departed friends and relatives. As Michael Tymn says in his review on this site, “there is no reason to assume that the author is trying to put one over on us or that his mother, the medium, was making a fool of him and her friends for many years.” To think otherwise is ludicrous. These words are particularly meaningful when examining the book by Dr. Jan W. Vandersande, Life After Death: Some of the Best Evidence. Even though Flammarion was a scientist who spoke professionally about the reality of spirit communication, he lived long ago and the tendency by many today is to discount earlier scientists as being too gullible and not in possession of the latest technology. Flammarion was not the lone spiritualist in scientific circles of his day, of course, but it is refreshing to find scientists today who are unafraid to speak out in defense of phenomenon they have rigorously tested with the use of the scientific method. 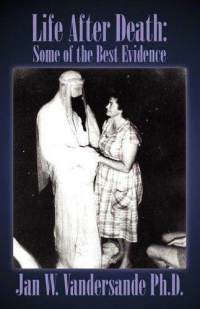 Vandersande is such a person and his book lays out quite clearly his personal experiences with spirit communication and materialization along with his evaluation of it. A reader cannot escape the fact that he, because of his education and training, is a qualified observer – someone who would not be duped by chicanery. Here is a physicist with an impressive resume who went far beyond almost all of his colleagues by investigating the phenomenon first-hand. Most scientists discount survival after death straight away and refuse to look at any evidence whatsoever. Vandersande’s approach is reasonable as well as scientific; his account carries weight and deserves to be taken seriously. Frankly, his conclusions seem to be the only ones possible. This is a remarkable book about the amazing materialization mediumship of Alec Harris, beautifully written by his wife Louie. The reader is treated to page after page of interesting recollections of a lifetime of service by this couple, most of it given freely to those who were grieving or in need of physical healing. It is a good companion book to Tom Harrison's Life After Death: Living Proof. Both volumes present excellent descriptions of materializations in comparatively recent years which proves that the glory days of spiritualist phenomena are far from past as naysayers often allege. The section of the book that appealed most to me was near the beginning where Louie described their introduction to spiritualism and the process of development of their mediumship gifts. This shows that there are still those who are "called" to serve in this capacity and that the road to development can still be taken. Reading further one will discover the immense satisfaction mediums can enjoy when they see how their unselfish service helps those in need. I heartily recommend this book. It is a fascinating account, well written and beautifully produced. David, thanks for your three book reviews. Have you read Stewart Alexander's autobiography, "An Extraordinary Journey"? The Solomon book, "The Scole Experiment?" - I recommend them both. Read all the books. Am a believer and a medium-newby-but not to the phenomenon. Thanks for blog.